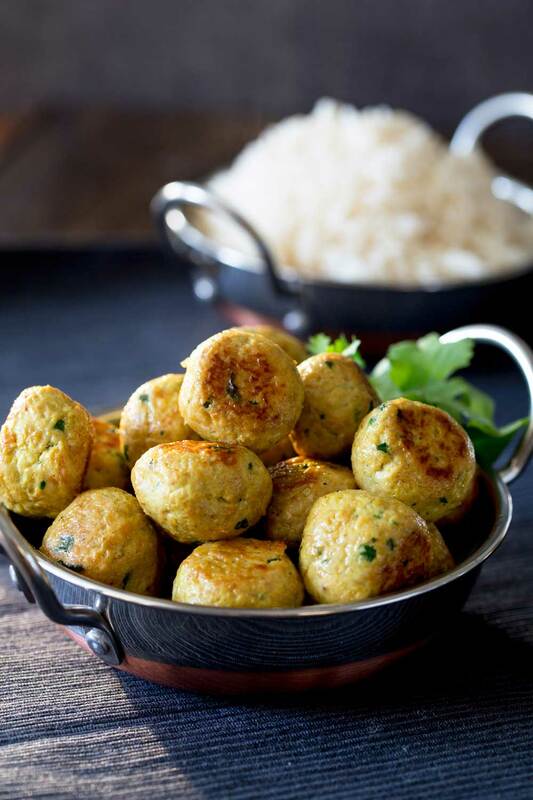 These Indian Spiced Chicken Meatballs are sure to be a hit!!! Tender, succulent and packed with wonderful spices. This is the deliciousness of curry in easy to eat meatball form. The perfect party appetizer, or serve with rice and dhal for a great midweek meal!. What spices should I use in these chicken meatballs? The wonderful thing about these meatballs is they have such a great depth of flavour but without the hours of cooking. The moisture in the chicken meat, soften the spices so they are balanced and well rounded without any raw spice flavour. 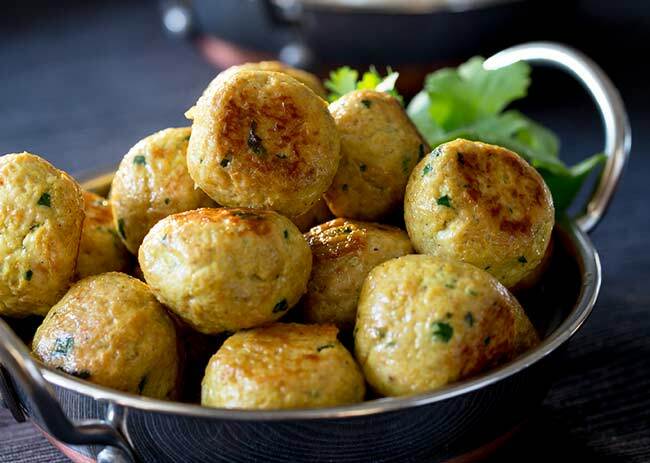 They are all mild spices that create an aromatic and flavor packed meatball rather than a spicy meatball. Can I make my own ground chicken for this recipe? I tend to buy my ground chicken (chicken mince) from the butchers, but on occasions if I find chicken on special offer I will mince my own. It is easy to do in the food processor. You can use chicken thighs, chicken breast or my favourite is a mixture of 3 chicken thighs and 1 chicken breast. I chop them into chunks and then pulse chop in the food processor until I have a course mince. Then proceed with the recipe as normal. 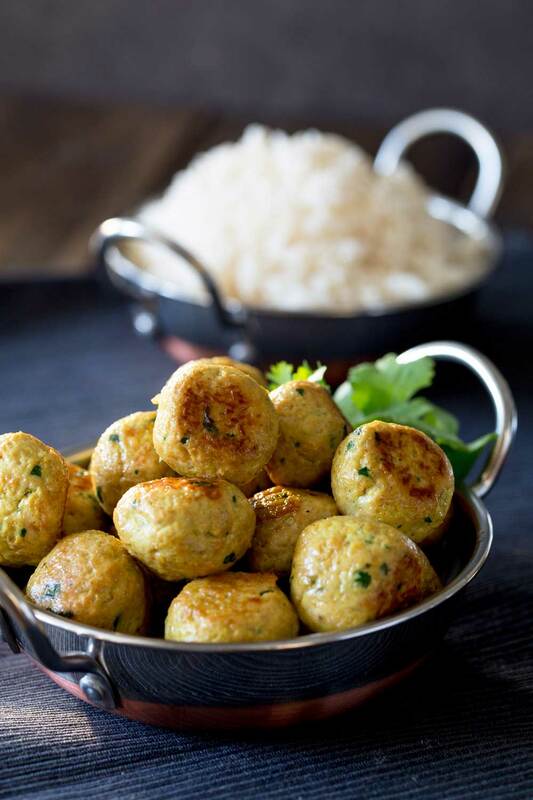 This recipe for Indian chicken meatballs also works well with ground turkey. 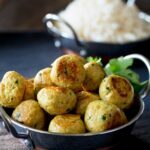 These indian chicken meatballs make the perfect party bite, as they are easy to eat straight from a skewer/cocktail stick and they are delicious served hot, warm or room temp. You could add a vegetable curry instead. My current favourite is this chickpea and potato curry from my friend Richa over at My Food Story. 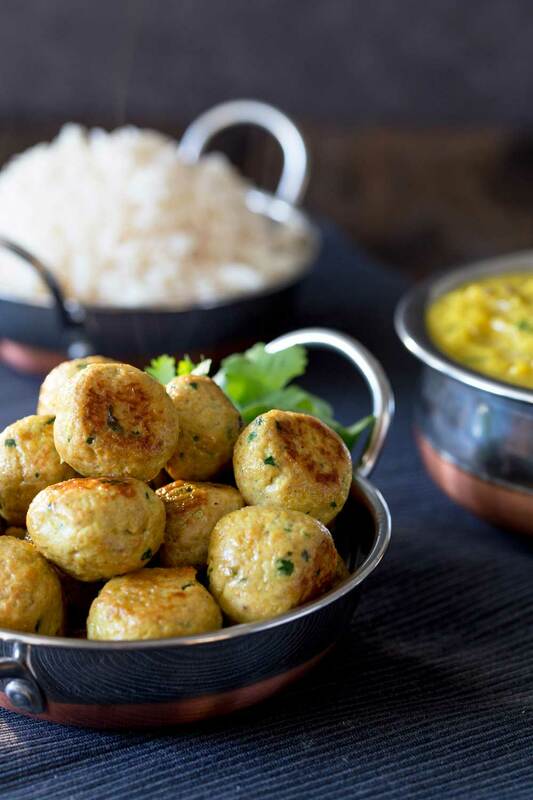 These Indian Spiced Chicken Meatballs are sure to be a hit!!! Tender, succulent and packed with wonderful spices. This is the deliciousness of curry in easy to eat meatball form. A GREAT PARTY SNACK! Peel the onion and garlic and place them into the food processor. 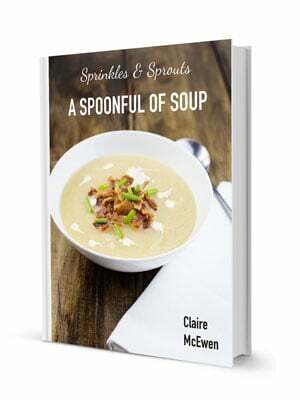 Whizz on high powder until you have a onion smoosh. Finally add in the coriander and pulse to just chop. Tip the onion mixture into a large bowl and add in the chicken mince. Use you hands to mix everything together. Use a tablespoon measure to scoop out a ball of mixture and smooth into a ball. To cook, heat a small amount of all in a frying pan and cook the meatballs for 3-4 minutes before turning and cooking for a further 3 minutes. I LOVE LOVE LOVE meatballs! For me they are the perfect little bite! AND you can mix up the flavour with so many different things! PLUS you can serve them in so many different ways! 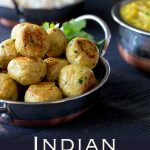 If you love food why not subscribe to my newsletter, I will drop you an email every now and then, just to say hi and send you a couple of recipes think you might love, like these Indian chicken meatballs. I love Indian Inspired recipes! These look great and your photos look amazing too! Thank you Veronica, they are so packed with flavor thanks to those spices.